Well, it wont take me long to tell you about our day today! We're still nestled on The Mannix Point campsite near the town of Cahersiveen, but mostly we've been restricted to the comfy confines of T4rdis2 by the weather. It was absolutely awful with howling wind (40 mph gusts) and almost continuous rain that banged loudly on T4rdis2's roof - and it was cold! Our plan had been to go out 🚴 but that was very quickly shelved - instead we treated ourselves to a duvet day - so it was feet up and kindles out! However, we did manage a short walk into the town and down to the marina that sits on the Fertha River in the afternoon. And one of the other main standout points of the town was The Catholic Church that is named after the local hero - Danial O'Connell 'The Liberator' - who was born here and who is said to be Ireland's greatest ever politician. This morning we set off on our bikes for Kell's Bay Gardens - we had intended taking T4rdis2 but the campsite owner warned us against that - and as we neared our destination we could see what he meant! The roads were narrow and the parking spaces tight - however, I was a bit miffed because when we arrived there were no bike racks to be found. Then added to that, the gardens weren't quite what I thought they'd be either! In their advertising they said you could expect to see The Ladies Walled Garden, The Primeval Forest, The Bamboo Glade, The River Walk, The Cliff Walk, The Bog Walk and The Palm and Succulent Garden - so after paying our 8 euro entrance fee I was expecting to find some formal areas and something that would take all day to explore! 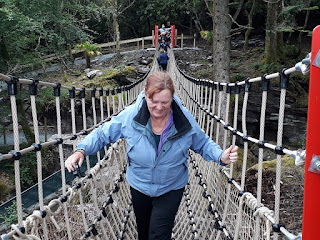 However, what we got was a looped walkway that took us through a sub tropical forest where dinosaurs lurked and where we had to cross a 112 foot Sky-walk Rope Bridge that swayed alarmingly as you went - it was brilliant! 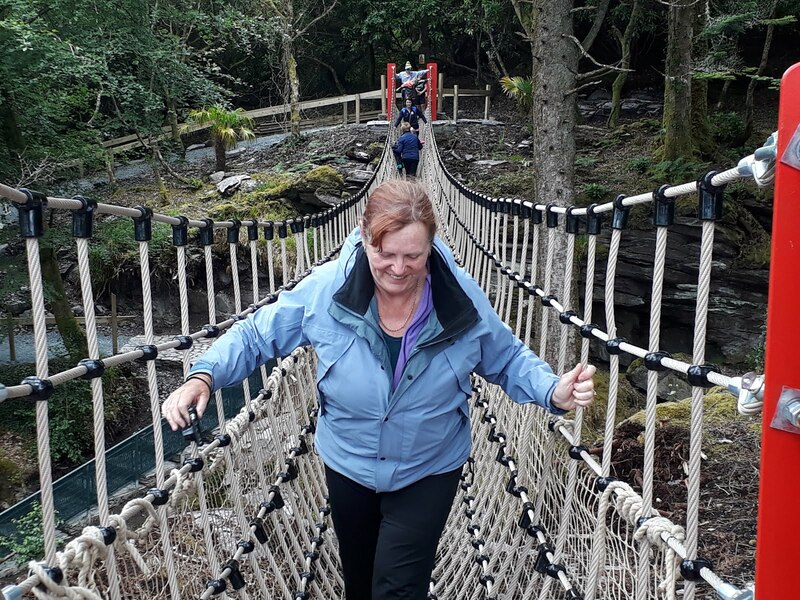 It's Ireland's longest rope bridge and it was only installed last year to facilitate access to a part of the garden that had been cut off several years ago by a wicked storm! But our exploration certainly didn't take all day, so even though we lingered to look at the many fallen tree sculpted monsters, and paused by the gushing water fall, we were all done after a couple of hours - so our next task was to find a suitable dining room for lunch, and the beach at Kell's Bay proved to be the perfect place! Then after we'd eaten we started on our homeward journey, but as it was still early we detoured a little to see Ballycarbery Castle which we can glimpse the turrets of from our pitch. The castle dates back to the 16th century, and it felt quite peculiar to be stood beneath it's lofty walls - you could almost hear the sounds of ancient times, and I wouldn't have been surprised if a Knight in shining armour had poked his head out of one of the narrow arrow slits that are dotted along the bottom of the remaining wall. The southern wall of the castle is missing completely - apparently in the past local farmers took the stone to build their houses, and that combined with years of Irish weather have taken their toll on this magnificent grand old structure. To round off our outing we sat and sipped our coffee on the banks of the River Fertha and then finished our 25 mile ride by tootling along quite roads back to T4rdis2 where a welcome cuppa awaited. Today was another moving day, but until about 2pm our activities were restricted on 2 counts! Once again by horrible weather, but also by the 33rd annual Ring of Kerry Charity Bike Ride which has a circular route of 112 miles with it's start and finish in Killarney. We weren't really sure how many individuals took part - the lady in the tourist info shop said 6000, but 'on line' it said there may have been as many as 9,000 - either way, the roads would have been chocka so until it had passed by our campsite there was no way we could travel! And really, because our time in Ireland is running out now, we'd have liked to have got as far as the Beara Peninsula, but that would have resulted in us having to pass through Killarney at about the same time as a huge number of the riders would have been finishing - imagine a few thousand cyclists + all there supporters etc all clogging the Cities streets - no thanks - we'll save that pleasure for the morning. So in the end all we could really do was move to what we thought would be a good setting off point for tomorrow, but that resulted in Mrs Snoopy leading us along the garden path again! We'd picked a wild camp spot at Cromane where we would be overlooking Dingle Bay and have distant views of Inch Beach, and very nice it turned out to be! But 'oh dear' to get there was a bit of a performance! As usual we dutifully followed Mrs Snoopy's instructions, but she soon had us on a narrow 'T4rdis2 width' track with grass growing down the middle, and this went on and on and on and on! Then after a couple of miles (with only 2 passing places) we found ourselves following a van with a trailer, and at this point Mrs Snoopy said 'turn right'. Luckily, the van driver leaped out of his cab and shouted 'don't do it'! In his broad Irish accent he explained that if we went that way 'we would surely come a cropper' because of low overhanging trees etc that would damage our van - and the jist seemed to be that there certainly wouldn't have been anywhere to turn around. However, local knowledge is a wonderful thing because he was able to advise us of an alternative route so in the end we landed quite safely! View of Dingle Bay and Inch Beach from our Windscreen! This morning we left our wild camping spot at Cromane (which we'd shared with a French and German Van) and aimed T4rdis2 at Killarney - and once again Mrs Snoopy had a go at wedging us in on tiny roads - however, John was not being HAD a second time! He politely told her where to go (it started with F and finished with F) and then tootled along pleasing himself which resulted in us arriving at our destination without any stress! Having said that Killarney was super busy on this second day of the main holiday season, so it was a quick pause at Lidl to stock up, and then we hightailed it out of the town as quickly as possible. Our target for today was the Beara Peninsula which is the 3rd of the 5 fingers that stick out into the ocean on the Atlantic side of Ireland, and to get there we had to cross over the rugged but very picturesque Caha Pass. Now, very early on as we were heading towards our destination, the signposts warned that there was a 3.4 metre height restriction, but we didn't worry because T4rdis2 is only 3.2 metres. However, when we got there it wasn't just one restriction - it was 4 - and they were all very roughly hewn rock tunnels that required us to drive down the centre of the road to achieve the required height - and even then the ceiling and walls seemed to be within a hair's breath at times - mind-you - it's not scary if you shut your eyes! The Pass eventually dropped us down into the town of Glengarriff and from there we continued onto the Peninsula with Bantry Bay on our left and the Caha and Miskish mountain ranges on our right - both providing spectacular vistas to entertain us as we went. We eventually settled at a small campsite on a golf course about half way along the peninsula, which once again, is providing oceanic views directly from our T4rdis2's sitting room! However, unfortunately as we touched down so did the rain so our outings will have to be saved for tomorrow - but hay ho, at least it gave me time to get the washing done and we've now both got clean 👕👚👖. Monday 3rd July 2017 - Weatherwise - a horrible day! The morning dawned fine but overcast and misty, but as we're only staying on this peninsula for today we needed to go out if we were to see anything of it! So we packed our picnic and untethered our bikes - but even before we set off the rain had started and the mist was thickening. Our target for today was Dursey Island which lies at the very tip of the peninsula and has a cable car that links it to the mainland, and if we'd got all the way there our journey would have been about a 34 mile round trip. However, by the time we'd done 10 of them we were soaked through to the skin and, to say the least, we weren't enjoying ourselves. Therefore, when I suggested to John that we give up and turn back he spun round quicker than a flipped coin and we were soon peddling back the way we'd come. It was a shame really because I'm sure that Beara has a lot to offer in the way of scenic beauty, but with the thick mist it was hard to see more than a few metres to the front and either side was almost entirely shrouded, so the area's ruggedness and craggy mountainsides, along with it's coastline were almost completely hidden from view. Therefore, Beara will have to be added to our list of places to revisit - thus providing us with a good excuse to return to Ireland soon!